The 2019 Lok Sabha polls would be Prime Minister Narendra Modi's Waterloo moment, senior Congress leader Veerappa Moily said on Wednesday, adding the PM has no faith in his party or cabinet. PM Modi has no faith in his party or cabinet, said senior Congress leader Veerappa Moily. 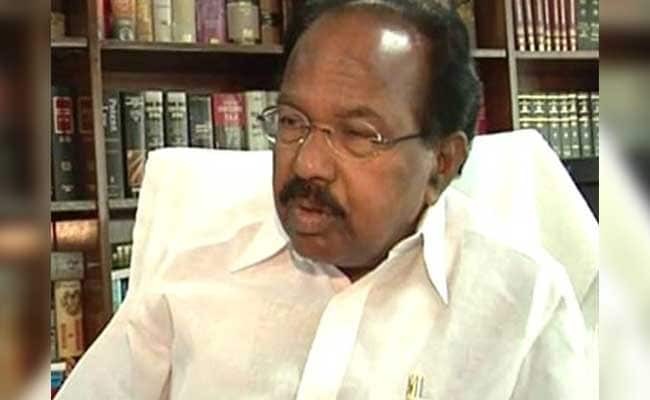 Thiruvananthapuram: The 2019 Lok Sabha polls would be Prime Minister Narendra Modi's Waterloo moment, senior Congress leader Veerappa Moily said on Wednesday, adding the PM has no faith in his party or cabinet. He accused the BJP-led NDA government at the centre, which has completed three years in office, of "abusing" government funds for party propaganda. Government departments and public sector undertakings have been asked to invest not in implementation of programmes, but in propaganda, he alleged. The former Union minister said although the Modi government had promised to create two crore jobs a year, only 1.35 lakh jobs have been created during its tenure. "We have a Prime Minister who has no faith in his own party and no faith in his own cabinet...but he has full faith in himself....This is the person who is now presiding over the destiny of this nation," he told reporters. Stating that the Congress would improve its performance in the coming elections and that preparations were on in this regard, Mr Moily added procedures for AICC revamp were also underway. "Congress is picking up... Rahul Gandhi is taking decisions... reorganising the party and we are marching ahead...and 2019 will be a Waterloo for Modi," he said. Though Congress had won in the Assembly elections in Goa and Manipur, the success of the party was "hijacked" by BJP, he alleged. Also, the UP Assembly election results could not be considered as a defeat or an adverse result to Congress, he said. Mr Moily, a leader from Karnataka, expressed confidence about the Congress' success in the 2018 Assembly elections in his home state. "Chances are quite bright (for Congress). There is absolutely no anti-incumbency wave against the present state government. People have already given a verdict against corrupt governments like that of Yeddyurappa," he said. BS Yeddyurappa is BJP's chief ministerial candidate for the state polls. Asked about the CAG findings on the Vizhinjam project signed by the previous Congress-led UDF government in Kerala, Mr Moily said the MoU was signed considering the state's larger interests. CAG is only an audit body and its findings cannot be taken as a verdict against any government, he added.